"We know that there’s more to East Bay dining than Temescal, Rockridge and the Gourmet Ghetto. NOSH’s neighborhood guides explore the best of the rest. This month, we explore Oakland’s Koreatown-Northgate neighborhood, also known as KoNo." Click here to read all about KONO's great dining opportunities. See interviews with the artists and work in progress, in this video produced by Laney College Digital Media Club. 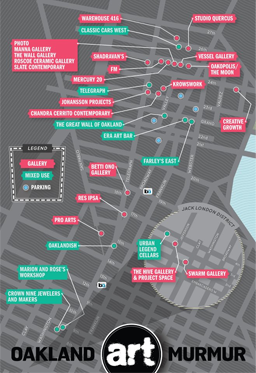 Go on a self-guided tour of the Art Boxes with our neighborhood map. A big thanks to all the artists: Fulani Carter, Eddie Colla, Jack Eastgate, Stevan Guiterrez, Lisa Hoffman, Dave Young Kim & Stephanie Leung, Joanne Ludwig, Pancho Peskador, David Polka, Lynne-Rachel Altman, Momoko Sudo, Ashia Tymous, and Desi Wome. In 2017 KONO has invited some of the artists back to refresh the art. Koreatown Northgate includes an important Korean-American commercial center, a creative arts community, Alta Bates-Summit Medical Center and other healthcare services, new residential projects including the Telegraph (old Sears) Lofts and a growing variety of multi-ethnic restaurants, shops and services that are working to revitalize the neighborhood. This uniquely Oakland event draws 20,000 people to the area. Be sure to check it out. KONO is the neighborhood that defines the new Oakland. This up and coming community has become the hub of arts and culture in the Bay Area, featuring the Oakland First Fridays Festival and Art Murmur Gallery Walk, which draws over twenty thousand attendees each month. Oakland has the second highest per capita of artists in the country and KONO is their home base. Along and with the arts, KONO features Oakland’s most popular craft beer gardens and pubs. Visit KONO to see what all the Oakland hype is about.